Here you will find examples of mail art. Most of the images have either been created by me, or received by me. Whenever possible I've credited the artist. Once you "get" the idea, Mail Art is fun, easy, and somewhat addictive! This is a photograph of a skylight in LeCorbusier's monestery in France. I had it made up into postcards back in '95, even before I knew about Mail Art. If you send me a postcard you've made, I'll send you one of these. Offer good for as long as the supply lasts! 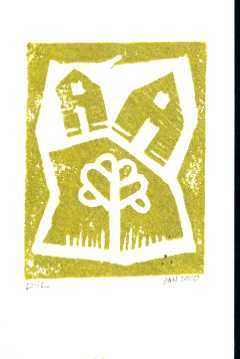 The original is a block print, in gold ink, image size 3x4, printed on post card paper [4x6]. It is inspired by my love of Shaker architecture and interest in Shaker life. I created the image originally for a mail art project on the theme "home". MORE, MORE By gosh, show me more!